Last Monday night, staff at the Humane Society of the Pikes Peak Region (HSPPR) in Colorado Springs, Colo., made their final rounds for the night, secured every kennel, and locked the doors to the shelter tightly before heading home. 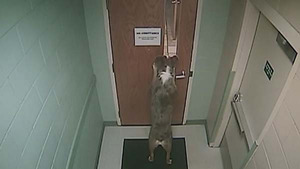 A review of the security footage revealed exactly how the Australian Shepherd managed to escape the shelter. When they arrived back at the shelter Tuesday morning to start their daily routine, a quick check on the animals revealed that one dog, a 5-year-old Australian Shepherd who’d recently come to the HSPPR, was nowhere to be found. Staff members searched all over the shelter complex but to no avail. Exactly what happened to this missing dog? A quick viewing of the overnight security camera footage provided the answer everyone was looking for. It seems in the early morning hours Tuesday, before the workers arrived at the building, the sly Aussie managed to wriggle his way out of his locked kennel, then through not one but two locked doors to break free from the shelter building. The staff members could not believe what they were seeing on the security tape. But the talented dog’s amazing escape shouldn’t have come as a surprise to anyone — after all, the clever pooch’s name is Houdini. Sure, breaking out of a secure building is an impressive feat for a dog, but it’s the next part of Houdini’s act that is nothing short of magic. After he left the HSPPR building, Houdini wound up wandering through a nearby neighborhood. That’s where Colorado Springs resident Ashley Heister found Houdini. She brought him back to HSPPR a few hours later—but not before falling in love with the awesome Aussie. She told shelter staff that if Houdini’s owner didn’t come for him, she’d come back and adopt the sweet dog she’d found. Meanwhile, back at HSPPR, Pressley says it is unlikely Houdini’s antics will be forgotten anytime soon.